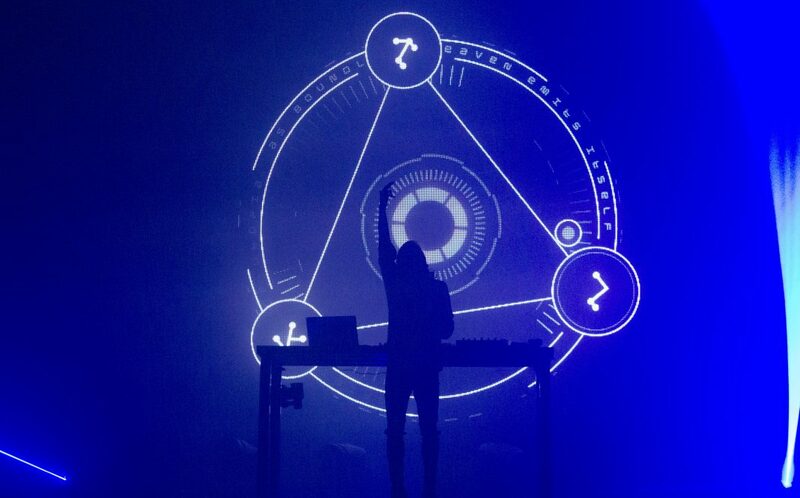 Virtual Self, the new project from the ever-evolving Porter Robinson, has been lighting the music world on fire since it was truly introduced to us this past year. This project is a far cry from anything we heard in the past from Robinson and has breathed some incredibly fresh air both into his musical collection and electronic music as a whole. This new high-energy, fast paced techy homage to an older sound brought to new life in the present day just solidifies Porter Robinson as one of the most incredible minds and daring risk-takers in all of music. Always pushing his image and sounds to new and different creative places, Virtual Self is a new frontier in its entirety from his past work. It’s aggressive, it’s robust, it’s dynamic, and most of all it is an entire new entity well separated from any past Robinson work. Led by his two creations, technic-Angel (shrouded in black) and Pathselector (in glowing white and masked in gold), Virtual Self has launched quite the new breed of sound and creativity overall, giving life to these two characters as the true faces of the project and lending their personalities to each track in order to truly give them life and differentiation. A prime example is my personal favorite Virtual Self track thus far in “Ghost Voices”. The original song was a Pathselector creation, but recently we got ourselves a beguiling remix from technic-Angel entitled “Angel Voices”; it really is one ego remixing the song of another and making it their own. It is quite remarkable the ebbs and flows of these tracks between these characters, with Robinson at the helm conducting this one-of-a-kind two-part symphony. Virtual Self already took a big step in the launch of its self-titled EP this year, and now comes another in the form of the Virtual Self Utopia Tour that stretches across North America in the dwindling days of summer into fall. You can see the dates below, as well as knowing Virtual Self is bringing its beautiful sound to Hard Red Rocks on August 2nd and Hard Summer on August 5th. I would grab tickets to any of these if I were you. Expect plenty of lasers, speedcore jams, and an everlasting energy and excitement that will have your heart pulsating even hours after the show is over. Anything Porter Robinson seems to sink his teeth into is pure gold; Worlds changed the entire landscape of electronic music and Virutal Self is set to do it once again. Three years of undeniable dedication has culminated in one of the most exciting new projects in recent memory. Porter Robinson is truly the gift that keeps on giving in music. And Virtual Self is quite the riveting new gift.